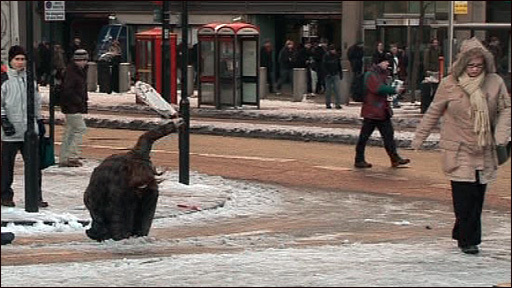 Commuters faced a second day of disruption caused by London's heaviest snowfall in 18 years. On public transport, there were signs of improvement late Tuesday, with only two Tube lines experiencing severe delays through the evening rush hour. Train companies continue to run reduced or altered services, while 95% of bus routes are operating. London City Airport reopened but delays and cancellations continued throughout the day at all airports. Both runways at Heathrow Airport reopened, but airport owner BAA advised all passengers planning trips on Wednesday to check with their airline before travelling as backlogged flights are cleared. Drivers are also warned of treacherous conditions overnight, as wet roads freeze and become icy. Many schools were expected to reopen by Wednesday but parents are urged to check with their local school or borough first thing on Wednesday. Services on Tuesday were badly affected on South West Trains in and out of Waterloo, Southeastern and Southern trains were also badly disrupted coming from Kent and the South Coast. The Tramlink ran a partial service between Wimbledon and Wandle Park in south London. Several bus routes were suspended or redirected because of blocked roads, Transport for London (TfL) said. 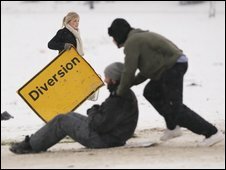 The London Chamber of Commerce and Industry said the heavy snow had badly affected businesses. It reported almost 90% of firms were operating below full capacity and more than half said the inclement weather would have a serious impact on productivity. 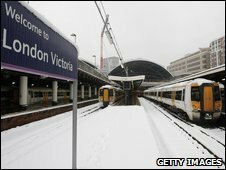 Transport for London commissioner Peter Hendy apologised for Monday's disruption, saying: "It was the worst snowfall for two decades. "The local authorities deployed everything they had on Sunday night and Monday morning, but it just wasn't enough for the circumstances." He said all buses were cancelled on Monday due to safety concerns after more than 20 slid off the road on Sunday night.